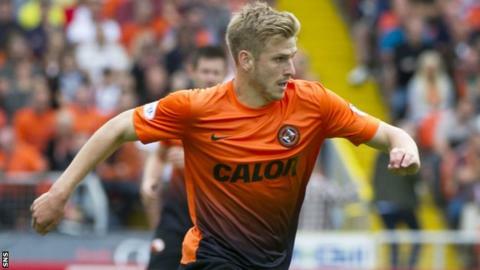 Dundee United midfielder Stuart Armstrong has signed a new one-year deal at Tannadice. The 21-year-old, a product of the club's youth system, will remain at the club until 2016. Armstrong has impressed under United manager Jackie McNamara and also captained Scotland's U21s. "I'm really enjoying my football here, playing week in and week out," said Armstrong. The midfielder added that it was important to be playing regular first-team football at his age. McNamara told BBC Scotland: "For us and everybody connected with the club, it's great news because he's a very influential player for us. "For Stuart, I think he's happy with his football at the moment and the way he's progressing and he sees his future here for the next year or two. "I think he brings his pace, his intelligence and he's bringing goals to the team. "In certain games, he's made some fantastic runs. At Celtic and in the Cup game against Kilmarnock, he's driven the team on. I think he's really matured as well." McNamara said Armstrong's new contract was an example of the "positive vibe" around Tannadice. He is also keen for midfielder Gary Mackay-Steven and defender Gavin Gunning to sign new deals. Mackay-Steven, who arrived at Tannadice after spells with Ross County, Liverpool and Airdrie United, recently won his first Scotland cap. Gunning, 22, joined United in 2011 after leaving Blackburn Rovers.